My 3 ½ year old grandson thought of this costume. Last year he decided that this year he wanted to be a pickle. No matter how much we tried we could not convince him to be any thing else. So I, Grandma, got out my sewing machine. Since he lives 300 miles away I had to have Mom and Dad do some measuring. I decided to make it a long tube of olive green polar fleece in four sections. Each section was tapered in at top and bottom to make an elongated oval so that when sewn together it formed a round tube. I cut simple tube out of a stretch fabric for a lining and attached a hood. I measured down about 9 inched and cut a face opening in the front seam of the fleece and stitched it to the lining hood. I also left the seam open on the side for the arms and stitched the arm holes to the lining. I sewed the bottom to the lining which pulled up the fleece and gave it a puckered up look like a pickle. I then added lots and lots of batting, stitching it by hand to the seams as needed. I closed the back with Velcro from the neck down. 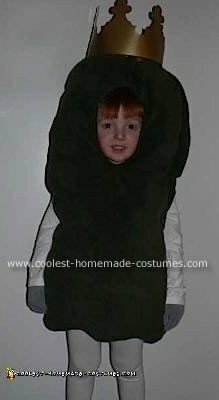 About this time, my grandson decided that he wanted to be a cucumber instead of a pickle. Thank goodness he really did not care what you called it. Since King Pickle is such a big brand in the area they live, they decided to add a Burger King crown, spray painted gold, and have arms and legs look like the King Pickle. He looks like he just came off the label. Cutest pickle. Not just coolest! WHAT AN AWESOME GRANDMA YOU ARE! THAT’S TERRIFIC.